We went to the pictures the other day for the first time since Slumdog Millionaire, entering with some trepidation, wondering if our eardrums would survive. But we reckoned that going to the matinee of a film squarely aimed at middle and above in both class and age, we were safe. And we were. We went to the art cinema rather than the Odeon and settled down amongst some very well-dressed people with white hair. Is this a great film? I’m not sure. The plot was predictable of course, and I don’t think I’m spoiling anything by saying that in the end the king triumphs over adversity with the help of an unorthodox speech therapist – one with no qualifications to boot. Some of the jokes were good but some fell flat towards the end. And the set piece, of fast action to excited music (thanks, Mozart), seemed to be just what it is: a set piece designed to create emotion, only it didn’t. It was faintly embarrassing because of its transparency. So is this a great film? You bet. Because it sets your solar plexus a-quiver and, unless you are very hardened, has the tears pouring down your cheeks. But why? Is it the script, the performances, the direction? Well, all of these have their part to play, and all of these will probably get Oscars, but I think the cause is elsewhere. You hear a lot about plot but rarely ever hear about theme. If plot is the bones of a story, theme is its soul. The theme of a piece can often be expressed as a cliche: ‘crime doesn’t pay’, ‘don’t believe what others tell you’, ‘triumph over adversity’, etc. 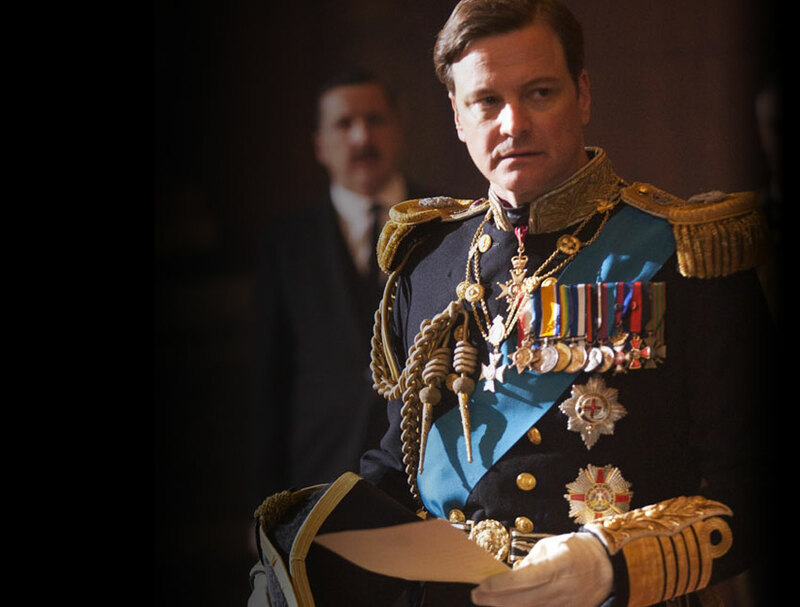 At first glance, the latter is the theme of The King’s Speech. But there is yet another level to this film. The personal drama of the Duke of York, overcoming his reluctance to be king, especially one with a debilitating speech impediment, is played out against the abdication of Edward VIII, the resignation of Baldwin and the advent of the second world war. What we are witnessing is the very peculiar and fateful change of main players. Scenery was shifting: the inadequate and downright bad were being displaced and the good were being shoe-horned in. For a moment I even saw the king as Frodo and the therapist, Lionel Logue, as Gandalf. These two have a part to play of mythic proportions in the battle of good and evil. The moment when the new king is walking side-by-side with the new First Lord of the Admiralty, Mr Churchill – that’s when I began to quiver. Because without these two men, one wonders if we’d have had the strength and conviction to win the war. Did the script writer set out with this story in mind? Perhaps. But all too often writers begin with one idea which then morphs into another one. The ‘hook’, the very gist of the film, which finally becomes the blurb of the trailer, often that’s the last thing the writer discovers. But the process of discovery is helped if the writer is concerned with two things: theme, and accuracy (that is, being true to the story). Getting to that psychological depth of understanding is the gift of the Muse. It’s a mistake to think that Muse inspires a piece at the outset. She doesn’t. Her work is to show us what it is we have. Her other name is Insight. I could be wrong of course and the truth is that the script writer had the whole story in mind when he began, that the irony of a stutterer speaking for a nation has long been realised by everyone except me, and that the script was all written down in a single draft. But somehow I doubt it. All the scheming and plotting in the world won’t result in something lasting, transcendent. Anything that’s authentic, that’s real, comes in the form of a gift. This entry was posted in accurate detail, plot, theme, truth in fiction and tagged Muse, plot, script writing, story telling, the King's Speech, theme. Bookmark the permalink. I think many people know that “Bertie” had a speech impediment, but how many know that Churchill also had problems? He was dyslexic, although dyslexia now has had many “strands” identified – ADD ADHD, Aspbergers Syndrome etc all run very similar, and we cannot be certain exactly what Churchill’s “syndrome” was – that’s not the point. Churchill had a disability which he overcame by using strategies. King George overcame his stammer by using strategies – my daughter overcomes her severe dyslexia by using strategies. I can tell you, though, as her mother I have had to fight the authorities throughout her school days – and even this month (she is now 27) we have come up against some serious misconceptions about dyslexia which bordered on prejudice . I cried during this movie (and laughed in places) Colin Firth – indeed the whole cast – made the story so utterly believable. The only people who tell us how true it actually is are the living relatives of the leading characters. There are a lot of people who knock the Royal Family for being an out of touch dysfunctional family of scroungers…. Well I’m sorry, but that man, the present Queen’s father has my complete and unwavering respect. He was forced to do a job he didn’t want to do and he did it above and beyond the call of “duty”. He put US – his people – before himself. And thank God he did, for without him – and without Churchill – I doubt we would be sitting here writing like this on this Blog because World War II would have ended very differently. I wouldn’t have been born for a start – my father was a POW, he would not have come home had Hitler won the war. Given the distress and anger that I and my daughter have been through two weeks ago by the thoughtless, arrogant words spoken to us about her dyslexia I hope people watching this movie take a moment to reflect that every disabled person – whatever their disability – has to fight to be treated with respect by thoughtless others – because disability does _not_ mean stupidity. I’m sorry to hear about what you and your daughter have suffered. Some people are jaw-droppingly stupid. What’s to be done?